Zwingli, a pastor and theologian, based the Reformation on Bible study. In his opinion the Reformation comprised fighting social injustice. He was born in the Saint-Gall canton in Switzerland and had a solid university education. He linked up with humanism and studied the New Testament in Greek in Erasmus’s edition. He also read the Old Testament in Hebrew. He was successively a curate in a countryside pilgrimage place, and then a Swiss army chaplain during the wars with Italy. In 1519 he became a curate in Zurich and started reforming the city – the local authorities progressively adopted his views and sided with him against the bishop of Constance. His Reformation spread to Basel and Bern, and to French-speaking Switzerland, thanks to the reformer Guillaume Farel. In 1531 Zwingli died at the battle of Kappel, the chaplain for Zurich troops. The conflict opposed six reformed cantons to five others which meant to remain catholic. As he was studying the New Testament, Zwingli found out that the doctrine and the practice of the Church often differed from, or even contradicted what was said in the Bible. Luther’s writings reinforced this conviction, though Luther’s central concern was with salvation, whereas Zwingli’s was with fully understanding and fairly implementing the Bible teachings. In Zurich he developed Bible study in which he compared the original text with various translations. In 1523 he wrote Sixty-Seven Theses, and was allowed by the city to preach from the Scriptures alone. Zwingli reorganised the Church and the training of pastors-the name given to ministers of the reformed worship after a sermon by Zwingli about « the shepherd » in 1523 (pastor means shepherd). 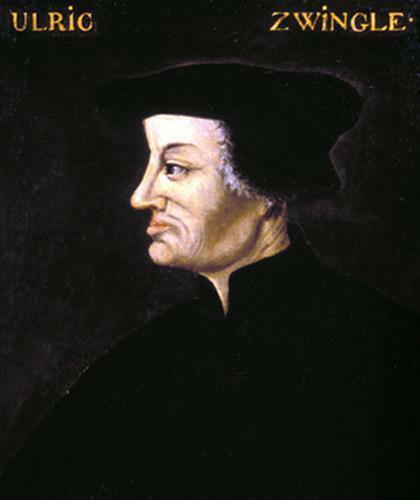 Zwingli did not wish the Church to be apart from society – he believed the ecclesiatical community and the civil society were not identical but overlapped. That prompted him to fight against socio-political abuse, in the name of the Gospel. Some of his early partisans were in favour of a clear-cut between the city and the Church. They broke away from Zwingly and founded the anabaptist movement, refusing to christen children. Suspected of being dangerous anarchists they were horribly persecuted throughout Europe, notably in Zurich where many were drowned in the lake. Luther and Zwingli met in Marburg in 1529. The meeting was organised by Prince Philip of Hesse who wished the various reformed trends to be allied. 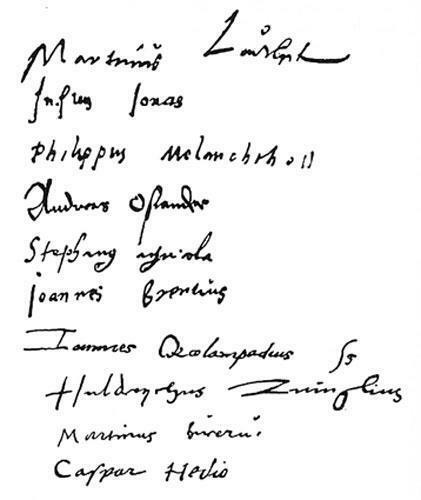 Luther wrote a text comprising fifteen articles. About the fifteenth that deals with The Last Supper, the two reformers agreed on several issues, such as the eucharist in two kinds, the idea of sacrament, contrary to the idea of deserving work; but they disagreed on the actual presence of Christ in the bread and the wine. The heavy confrontation prevented any agreement. Luther’s opinion was that the bread and the wine represent and hold Christ’s presence. Zwingli’s was that Christ was spiritually present (through the Spirit) in the lives, hearts and minds of the believers. The Eucharist was a manifestation of his presence, which they publicly proclaimed. For Luther the bread and the wine were instruments of Christ’s presence, whereas for Zwingli they were signs. Apparently Calvin neither met nor read Zwingli. He was nevertheless influenced by him through Farel and Bullinger (Zwingli’s successor in Zurich) with whom he signed the Consensus Tigurinus (« Zurich agreement ») that unified the reformed movements. Several of Zwingli’s theses can be found in Calvin’s ideas, such as the absolute sovereignty of God, the importance of the Bible and of the Spirit’s works in hearts and minds, predestination, the rejection of Christ’s material presence in the bread and wine of the Eucharist.